Thanissara is an Anglo-Irish teacher from London, and started Buddhist practice in the Burmese school of U Ba Khin in 1975. She was inspired to ordain after meeting Ajahn Chah, and spent 12 years as a Buddhist nun where she was a founding member of Chithurst and Amaravati Buddhist Monasteries in England. Her practice and teaching are also influenced by the teachings and practice of the Chinese meditation master, Master Hsuan Hua. 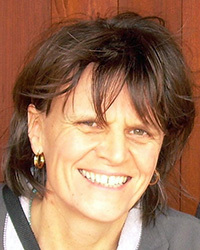 She has an MA in Mindfulness-Based Psychotherapy Practice from the Karuna Institute in the UK. With Kittisaro, she co-founded Dharmagiri Sacred Mountain Retreat and helped initiate and support a number of HIV/Aids response projects in South Africa. They also co-founded Chattanooga Insight, TN and Sacred Mountain Sangha, CA. She has supported a number of Climate Activist events, retreats, and programs, and is deeply engaged in applying the Dharma to our times of planetary emergency. Thanissara has facilitated meditation retreats internationally the last 30 years and teaches across the U.S.,in South Africa, Europe, and Israel. She is the author of several books, including her latest, Time To Stand Up, A Buddhist Manifesto for Our Earth, and is co-author with Kittisaro of Listening to the Heart, A Contemplative Journey to Engaged Buddhism.